Two websites (Volquest.com, ESPN.com) are saying North Carolina head coach Larry Fedora is going to interview for the Vols’ head coaching job. Tennessee would not have to ask permission to do so and, according to the Raleigh News & Observer, Kevin Best, a UNC football team spokesman, said Tuesday that Fedora’s policy is not to address speculation or reports related to his interest or involvement with various job openings. Fedora spent Tuesday in New York City with UNC AD Bubba Cunningham, where they traveled to attend a National Football Foundation banquet. Fedora recently completed his first season at UNC, where he guided the Tar Heels to an 8-4 record. The school hired him last December and he signed a seven-year contract that runs through Jan. 15, 2019. 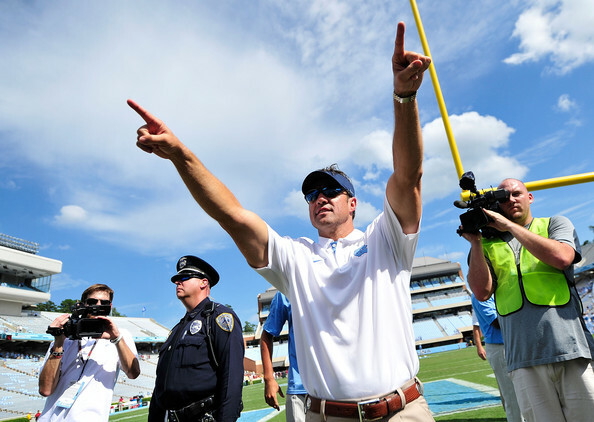 Fedora receives an annual salary of $1.7 million. He received a one-time payment of $400,000 after UNC hired him.